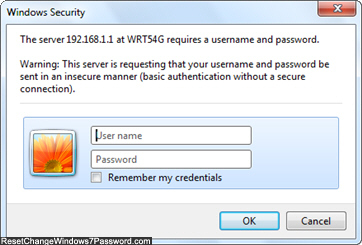 By default, most wired and wireless routers come with a default password of either "blank" (no password protection), or with the word "password" as their password. Obviously, this is a less than ideal setup, and you should change the router password as soon as possible. And security conscious users will also want to reset and change their routers' passwords on a regular basis. In this tutorial, we will show you how to reset and/or change the password of Cisco's Linksys routers, one of the most popular brands. First, open Internet Explorer, Firefox, or another web browser of your choice. Then, type the following "IP address" inside the address bar, as shown on the screenshot below: 192.168.1.1 and hit Enter on your keyboard. This is the universal IP address for Linksys routers - a numerical network address, just like websites use behind the scenes. Leave the "User name" text field blank, and type your current router password inside the "Password" text field below it; if you have not yet set a password for your router, try entering simply "password", or -if that doesn't work- leave the password field blank (empty). Then, click on the "OK" button or press Enter on your keyboard. As soon as you click, your web browser will show the password-change confirmation screen for your router, which will say something like "Settings are successful. You will be returned to the previous page after several seconds". Your router has saved your new password! And that's how you reset or change router password for the common Wireless G / Wireless N routers made by Linksys (now part of Cisco Systems). You can now close your router browser window.